How is it possible that I've gone 2 weeks without blogging? I kept meaning to, and would have the beginnings of posts forming in my head but I just never got around to composing them. Guess I should catch you up. I've made lots of progress on my accuracy quilt and I'm over half done. A feather variation has been the underlying theme, being quilted on all of the triangular spaces. For some reason, I've decided to not quilt most of the white fabric, opting to stitch-in-the-ditch so that it will pop more, especially the pin wheels. 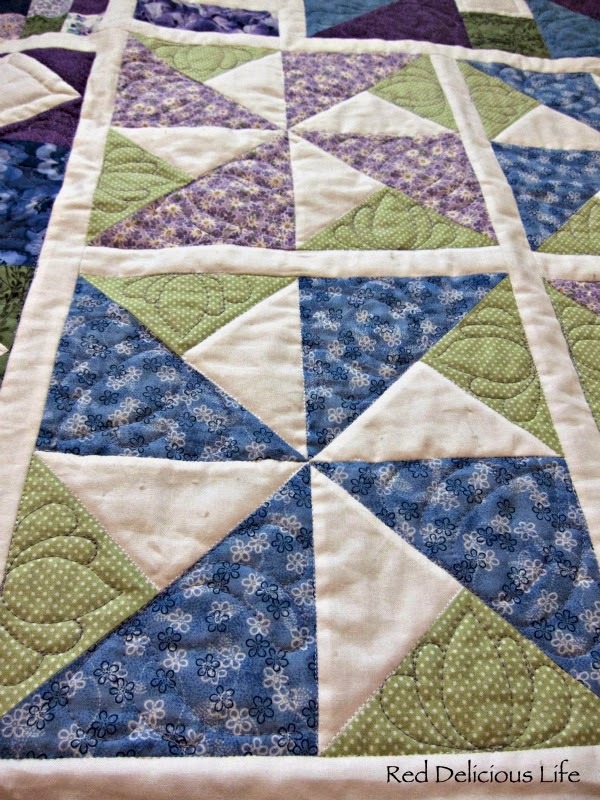 That decision involved picking out a large section which I had previously quilted. Here are a few close-ups. 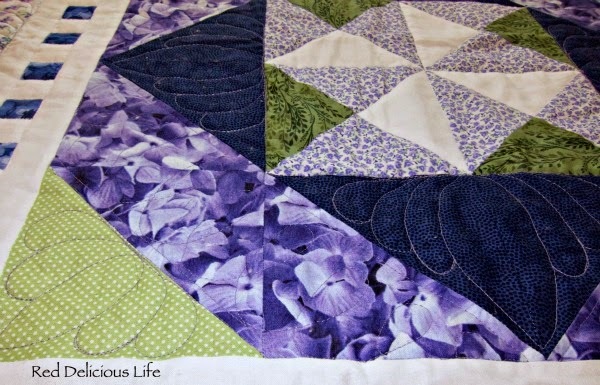 I'm looking forward to getting back to working on this quilt and possibly finishing it this weekend. I've been helping a friend with a secret sewing project so this was put on the back burner. Now that her project is done, I can get back to my quilt. As soon as I'm able, I'll share more about that other project. There's been lots of family stuff going on as well like school, potty-training, volunteering, and trips to Walt Disney World. I'm also starting back to work on a limited part-time basis but it's still a bit intimidating to me after being out of the work-force for 5 years. Lastly, I've become engrossed in a book. It's been a LONG time since I've read a book that grabs me from the first few pages and makes it hard for me to put down. I know it's good when I'd rather be reading instead of sewing. The book is Divergent by Veronica Roth. About a month ago, I saw a movie trailer for it (apparently it was released in March 2014 but I don't get to the movies very much). Something about it intrigued me and when it said it was based on the best-selling novel I decided to add it to my kindle queue. I started reading it this past weekend and I'm really enjoying it. And with that, enough blogging - I need to get back to my book! so good to see you are quilting this as it was the inspiration for me to make it too but I am leaving it unquilted until my quilting improves to hopefully do it justice. Best of luck with your return to work, glad I am of an age when work is over for me! I too enjoy a good read especially on a sunny day in th garden but that will not be happening for at least 6 months. Looking good Diana! my AFA is still a flimsy hanging in the cupboard! maybe over the Christmas period I will get a chance to get it out and get started! Interesting-looking book. Is it a bit like the Hunger Games? Hey You! Give Me Back My Mojo!